Book two of The Heaven’s Gate Trilogy. A weird western, a gun-toting, cigarrillo-chewing fantasy built from hangman’s rope and spent bullets. The west has never been wilder. A Steampunk-Western-Fantasy from Guy Adams. Those who have travelled to reach the town are realising that the challenges they’ve already faced were nothing compared to what lies ahead. The afterlife has an agenda of its own and with scheming on both sides of reality, the revelations to come may change the world forever. Once Upon a Time in Hell is available for pre-order at Amazon.com! 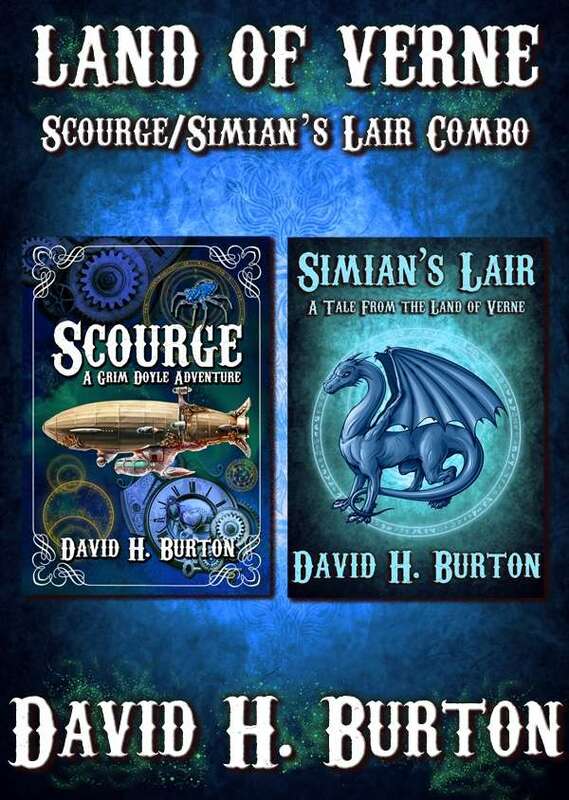 This steampunk fantasy combo contains the children’s novel Scourge: A Grim Doyle Adventure as well as the short story, Simian’s Lair: A Tale from the Land of Verne! Also includes the first chapter of the eagerly awaited Choose Your Own Adventure Novel, Billy Bones: Beyond the Grave! Land of Verne: A Steampunk Fantasy Combo is available now at DriveThruFiction.com! Abney Park’s Airship Pirates RPG is available now! Steampunk is wild and funky; it is innovative and adventurous; it offers us with a glimpse of a world that never was but could have been. These days there is no shortage of steampunk novels and stories; Anti-Ice by Stephen Baxter was my first real exposure to it, but one can go all the way back to 1967 and Queen Victoria’s Bomb by Ronald W. Clark to get your fix. And, yes, I know Agatha Heterodyne is part of a “gaslight fantasy”, but she’s too cute to omit. 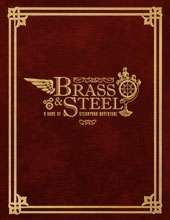 Brass & Steel is a hybrid live action/tabletop roleplaying game, with rules equally suited to both. It is an alternate 1905, where the mystically-fueled industrial revolution has produced amazing feats of technology and the sun never sets on the mighty British Empire. Clockwork marvels face off against against ancient sorcery. Airships cruise the skies. Lucid dreamers explore the mysteries of the subconscious and pluck secrets from the shadows of others’ imaginations. Mighty elixirs heal shattered bodies. Steam-powered prosthetics return crippled soldiers to the front lines wielding bizarre new weapons and equipment. 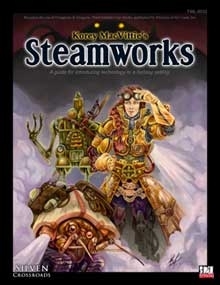 Brass & Steel: A Game of Steampunk Adventure is available at the Flames Rising Shop. 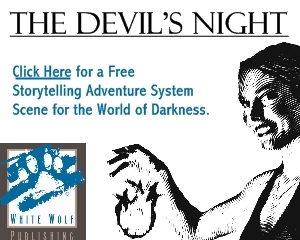 So, here we are readers, another late night at the old computer, another review, but this time it is a slightly different affair. Upon completion of George Mann’s “The Affinity Bridge” published by Tor, I happened upon a realization, OK, well not really a realization, more of a revelation, and not one in the biblical sense mind you, more of a traditional something that I hadn’t seen before until I opened my eyes sort of thing. Confused? Well, it seems as if you aren’t the only ones, because I am as well. So here we go with the admission stage of feeling guilty. I love books, which should be fairly obvious, as I take a great deal of time explaining to you on here, as to why I like or what I like about books. Normally I stick to Zombies/Survival Horror, not because that is solely what I read, as my house is quite literally overstuffed with books; but because I know that genre. I don’t live it; you won’t see me preparing for an all out zombie apocalypse on television or anything. I don’t live and breathe by Max Brook’s “The Zombie Survival Guide” though to be completely honest, after I read it; I did have the sudden urge to purchase my fair share of survival gear. But for the most part, on all conventional levels, I know that specific trope/genre/sub-genre extraordinarily well. It is often predictable; in its very nature is a formula, which is nearly standard issue for all true zombie/survival horror stories. 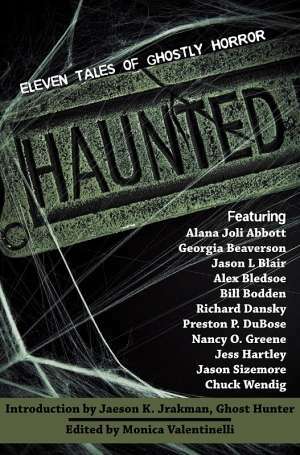 It doesn’t mean that it is not enjoyable, that there aren’t a lot of really great character driven stories out there- because I think, if you have read any of the reviews I’ve done here and elsewhere, you know, that I believe that I have helped pick out some of the better pieces in the annuls of the living dead. But, every once in a while, just every so often- I choose to read something that is completely unassociated with the “living” dead or zombies or having to defend yourself against homicidal post apocalyptic cannibalistic mutated savages. Ah yes, here we go. So when I was at Wizard World Chicago, see previous blog article on said adventure, prior to going into the actual convention I met up with Matt, our very fair minded and –not to be a kiss up, but really, in to in fact be a kiss up-wonderful editor handed me a box, which he so apply and verbally labeled as a “Christmas Present.” I asked as we stood in the lobby of the hotel, whether or not “Johannes Cabal the Detective,” was in the box or not? To which, of course there was the obvious reply, yes. But the man wears sunglasses to obfuscate his eyes, which I believe hide his own supernatural abilities. Point being, I am scared of him, so I didn’t press the subject. Have you ever read a story that you know, absolutely know was a story that you read somewhere else, and then checked and racked your internal databanks and found you were right? Well you would if you opened up “Ghosts of Manhattan” and then scanned your shelves, if you’re like me, and looked strait at your collection of Batman graphic novels. Which, yes I know Batman is in and of him self a representation of the old Pulp novels and Magazines, and basically “The Shadow,” but unlike “Ghosts of Manhattan” Batman has evolved to a place in comics, literature or pop culture that is unprecedented. I could talk the shadowy secrets of Batman and his representations all day and night for a year strait and probably not find a lag in that conversation for more than maybe, maybe a few minutes. 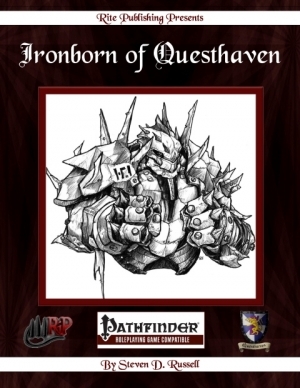 Rite Publishing’s Ironborn of Questhaven introduces a Pathfinder RPG compatible race and related mechanics in the vein of the Warforged from 3.5 Eberron and 4th Edition Dungeons & Dragons. I was pleasantly surprised at the cohesiveness of the product and only one thing made me frown while reading the 21 page e-book. I really like the race description as it is told in the first person perspective by the first Ironbound, Firstbuilt. Firstbuilt tells about how his race was born when a great artificer found her assistants lacking, so she built a construct to serve her. Then he, Firstbuilt, created another who also created another and so on. The good folks at Precis Intermedia have kept their quality streak alive with the release of Steampunk Musha, a “Victoriental Adventures” setting for Iron Gauntlets. It’s nice to see such an excellent gaming system as IG getting plenty of love and support; despite its relatively small size, PIG is providing as much and more support material for Iron Gauntlets than some companies 3-4 times its size are doing for their lines. Steampunk Musha is a good indicator of the high quality of these releases. It is the year 1867, and it is a time of revolution. The new science has done more than bring incredible technologies into the homes of everyday people. It has brought with it a new way of looking at the world. A way based on observation and logic that threatens the ancient dogma of Aluminat church teachings. New political ideas are sweeping across Europe. Bismark ‘The Iron Chancellor’ is uniting the might of Prussia and the social order of Europe is threatened by talk of Communism and Bolshevism. The industrial revolution seems unstoppable. New technology appears at terrifying speed. Machines are being crafted that seem capable of impossible feats. Many worry that mankind is becoming enslaved to the vast industrial machines that belch smoke into the streets of London. The recently-released anthology Steampunk, edited by Ann and Jeff VanderMeer, clatters and clinks with gadgets, airships, and forty-foot tall steam-powered men. The thirteen stories and novel excerpts contained in this collection are enhanced by a preface, an introduction, and two essays. The editors themselves are no strangers to strange fiction. Ann VanderMeer is an editor for Weird Tales and Jeff VanderMeer is the World Fantasy Award-winning author of Shriek: an Afterword as well as a collection of linked stories, City of Saints and Madmen, both set in the imaginary world of Ambergris. 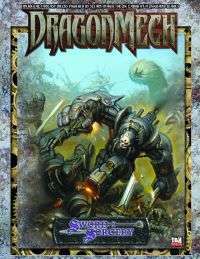 Steampunk has grown as a genre over the last few years and some very cool stuff has hit the shelves recently. Everyone has their favorites and we have compiled a list of the seven “must have” Steampunk books and games for fans to check out. Replete with whimsical mechanical wonders and charmingly anachronistic settings, this pioneering anthology gathers a brilliant blend of fantastical stories. Steampunk originates in the romantic elegance of the Victorian era and blends in modern scientific advances—synthesizing imaginative technologies such as steam-driven robots, analog supercomputers, and ultramodern dirigibles. The elegant allure of this popular new genre is represented in this rich collection by distinctively talented authors, including Neal Stephenson, Michael Chabon, James Blaylock, Michael Moorcock, and Joe R. Lansdale. This is a tightly presented 165 page PDF in two column format in a fair imitation of much of Wizard’s own presentation, it cover PC and NPC character clases, prestige classes, mechanical devices and effects, the interaction of magic and technology, automations, skills, feats and everything else. Basically this is one entire plug-in to bring technology and its users into the game, along with brief discussions on the affect technological change might have on a society and the means by which it might be introduced. To my mind there wasn’t enough material on this side of things, doubtless to make room for all the mechanical crunch. 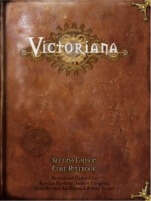 I write for Victoriana, though I didn’t work on the corebook, just so you know. Though I think I’ve established myself as a fair reviewer of products by now. In fact I’m writing this review when I really should be trying to get back on with some writing for Victoriana. Bad monkey, no biscuit. 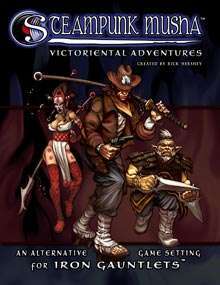 Anyway… Victoriana is a steampunkish, fantasyish, politically aware RPG of an alternative Victorian setting, the height of the British Empire, seemingly limitless technology, mediums, necromancers, strict class boundaries and – most importantly of all – top hats.